JVC DLA-HD950 review | What Hi-Fi? If you're of a certain age, your first memory of JVC might be of a VHS player or perhaps a chunky, but at the time astonishingly 'portable', camcorder. If you've waited until now to make JVC's acquaintance, may we suggest you take a look at its projectors? JVC may not concern itself unduly with the budget end of the market, but for mid-range and high-end big-screen entertainment, JVC is on top of its game. Set to run alongside the Award-winning '750 for now, this new model hopes to up its game still further. 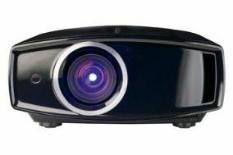 The DLA-HD950 is a Full HD, D-ILA projector claiming an impressive 50,000:1 native contrast ratio and packing THX and ISF calibration. There's a 120Hz clear-motion driver on board too, promising smoother-than-smooth motion. It's all delivered in a sleek, relatively slim, gloss-black machine, complete with side-mounted connections. You'll find two HDMI inputs, plus component, S-Video and composite inputs, and it's a doddle to centre, focus and set-up your picture – there's even a THX mode should you want to trust the experts with your picture's settings – and it runs at a deathly silent 19dB once you do. Terminator Salvation on Blu-ray provides a sepia tinged, action-packed picture that the JVC brings to life with remarkable insight, a steady hand with even the speediest action and an exhaustive range of subtle colour shades. The projector's ability with gloomy scenes is particularly striking. It digs up untold amounts of detail from deep, solid blacks. This is apparent watching Moon, which provides a natural colour palette alongside some bright, clean whites that are rendered faithfully with a sharp but smooth picture, adding a real sense of involvement. We didn't want to take the DLA-HD950 out of our reference room. It's one of the best projectors we've seen in a mighty long time, and well worth every star.